With the intention of testing my improvised cycling equipment, I decided to first pedal to nearby Tianjin, then ship the bike and take the train to Xi’an. I found the road between the two closest Chinese metropolises extremely full of traffic. All around me was a flat landscape suffocated by the terrible air of local industry. During the journey I spent a night in Songzhuan (宋庄), famous for being the new colony for Chinese artists. If you don’t have acquaintances that can introduce you to the labyrinthine interiors of artists’ homes, you’ll find exploring them a bit boring. Either way, the local artists of this creative colony are rapidly transforming it into a commercial hub for art merchants. 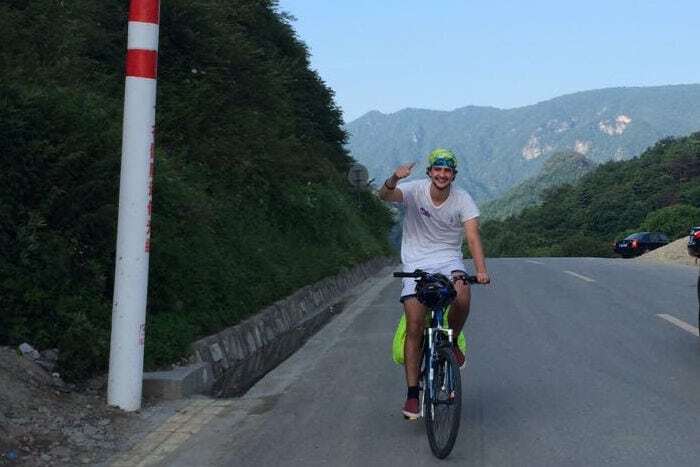 To make my test trip pleasant, Yu Xian (雨纤) took care of it, the lively friend of cycling known through WarmShowers, Couchsurfing for cycling tourists. 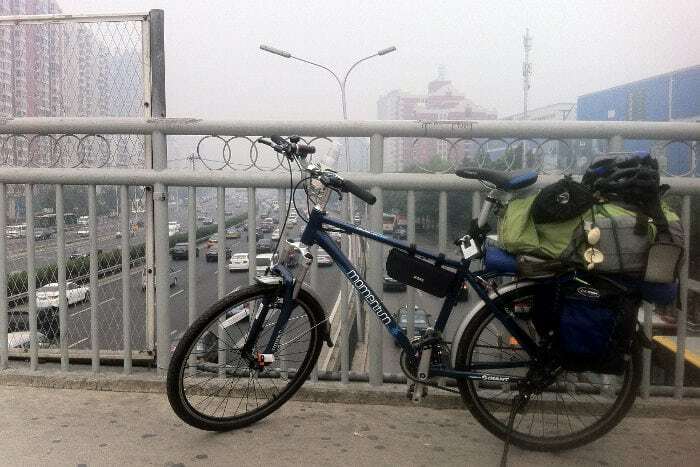 Arriving in Tianjin, after a first day of rest I set out to ship the bicycle. 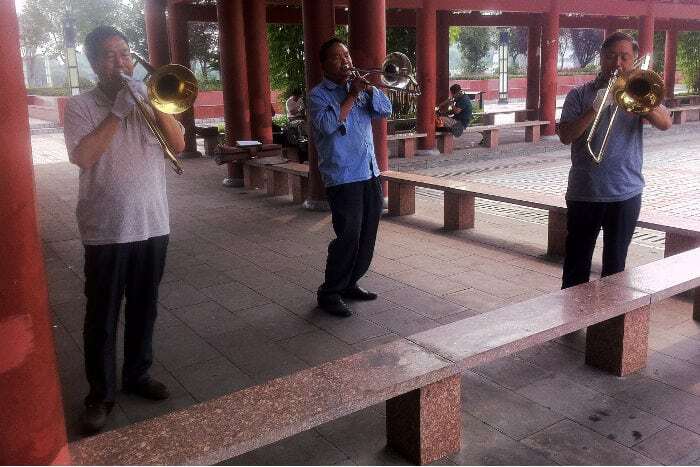 Despite the people of the place, oblivious to the practices, Baidu (百度) helped me find out all I needed to know. After a little insistence, the yawning workers of the China Railway Express (CRE, 中铁快运 Zhongtie Kuaiyun) decided to help me in my quest. Dismounting the most delicate parts, we packed the bike with great care, disregarding the local climate. Filling out the necessary forms, I gladly paid the 80 Yaun for such excellent service. Reinvigorated by the numerous snacks of the Muslim Quarter of Xi’an, I began my real adventure. Leaving from big cities on bicycle is always frustrating. Leaving from the big hot cities of China is worse still. Right at the end of a forgettable morning, I met two high school students that invited me to follow them on their cycling climb of the day. Unsuspecting and without training I found myself facing a climb of 1500 meters in only 30 kilometers. My slow crawl was repaid with beautiful views from Mount Qinling (秦岭山), a natural watershed between the Guanzhong plain (关中) and the Han River valley (汉河). Leaving the intense heat of Xi’an and reaching this peak following the green national road G210 is a pleasant adventure, regardless of the means of transport that you choose. Heading toward Chengdu – my first intermediate stop – I abandoned this route for the more congested G108. Following this road you’ll encounter four medium sized Chinese cities: Hanzhong (汉中), Guangyuan (广元), Mianyang (绵阳) and Deyang (德阳). The nation’s building development model has by now made the appearance a little depressing and indistinguishable from one another. The outskirts are long dusty work sites that are most definitely unpleasant to cross on bicycle. Getting far enough away, I encountered numerous farming villages of which the only indication of the surrounding development is the vast assortment of food available in the only local store. Among these villages, the beauty and history stands out in the mountain pass of Jianmen (剑门关, Jianmenguan, literally “Pass of the sword gate”). To the side of the old tower dating back to the time of the Three Kingdoms – obviously destroyed and rebuilt numerous times, the last being 2009 – you’ll find yourself in a picturesque tourist village. Spending a most quiet night here, I started again with my new road companions, met the day before. Like the great majority of cyclists that I met, my new friends are heading toward Lhasa (拉萨), the principal center of Chinese pilgrimage. The closer you get to the Tibetan high plain, the more you increase the number of categories represented, from simple walkers to more modern hitchhikers. Sadly, Chinese bureaucracy makes the participation of us laowai all the more complicated for this type of adventure. Under the tropical lower latitude rain I arrived in Chengdu (成都) worn out from pedaling and from the famous Sichuan Hot-Pot (四川火锅). To anyone who wants to taste this local specialty without compromising their touring plans, I strongly recommend that you stop before the salad. Capable of gathering the spiciest oils of the pot, usually served at the end of the meal, this dish is literally able to burn every form of intestinal life. Running low on pedaling days I then decided to skip the last part of the G108 to reach the more southern Panzhihua (攀枝花) by bus. With a surcharge of only 30 Yuan, bringing my bike with me was not a problem. 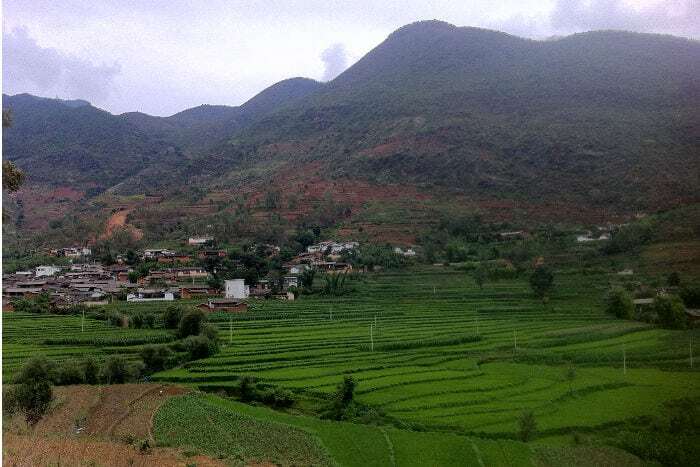 Rested, dry and thrilled, from Panzhihua I was ready to enter the long awaited Yunnan (云南). 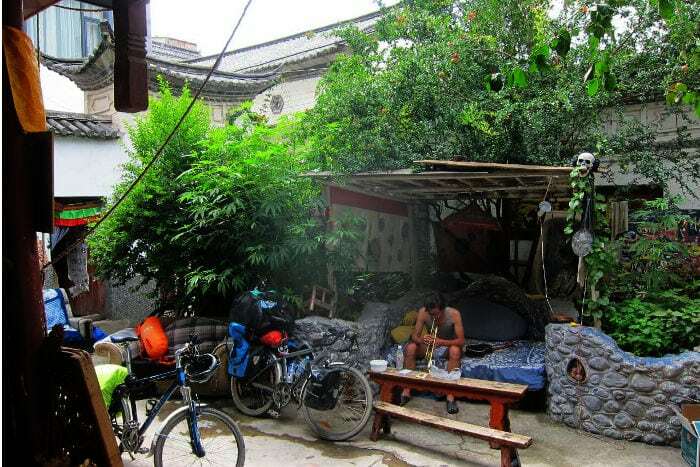 From Panzhihua I crossed a provincial road and reached Lijiang (丽江) in three days of cycling. The first part of this route could be romantically called the fruit street. Valley after valley you’ll run across fields of mangoes, pears and grapes. Along the side of the road are an innumerable quantity of stalls run by local farmers. With them all selling identical fruit, they’re only distinguished by the welcome of their smile. If the first part was a juicy romance, the second half of the road was for me a wet nightmare. Arriving in Yongshen (永胜) in late morning I decided to try and reach Lijiang at night despite not knowing the climb of the road. I then found myself having to face 30 uphill kilometers on a cold and rainy late afternoon. Arriving at the hostel late in the evening I was running low on dry clothes and motivation. While my equipment dried I took part in an expedition to nearby Snow Mountain of the Jade Dragon (虎龙雪山, Hulongxueshan). To reach these enchanting panoramas we passed through the ancient city of Baisha (白纱). Decidedly less congested than the historic center of Lijiang, this ancient little village offers intimate glimpses of lesser-known local cultures. To leave the hostel and get back on the road I was helped by my new traveling companion: a young Korean boy who just graduated and decided to cycle all the way to Norway. On the road to Dali, Yunnan revealed itself in all its much-awaited beauty. Magnificent mountains, terraced valleys and untouched villages of Chinese houses caused me to pedal with my jaw dropped for many kilometers. In the evening we stopped in Shaxi (沙溪), ancient intermediate stop on the vanished route that brought tea from Yunnan to Tibet. Today it is ironically far from all major road arteries in the area, sufficient enough to have the most untouched and representative historic center of the region. With so much beauty behind us we got back to our journey on the G214. In no time we reached the shores of Lake Erhai (洱海). 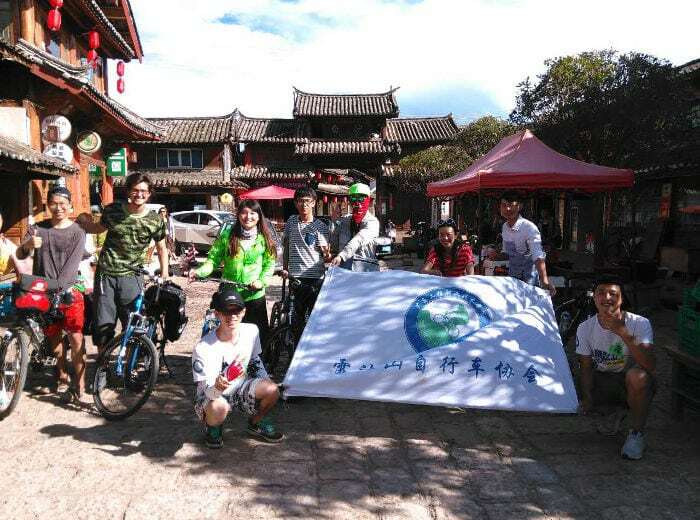 A marvelous ride of 40 kilometers between sweet gurgling waters and a profusion of grilled fish brought us that evening to the ancient city of Dali (大理古城). Cradled by the lake and protected by Mount Cangshan (苍山), thanks to a cost of living that is decidedly low, Dali has attracted a vast community of artistic and creative spirits, both Chinese and international. The commercialization of the area is however already reducing the number. We found lodging in Fabrizio’s laboratory – an Italian traveler and keeper of a long list of trades and adopted countries – we shared travel stories and participated in an “experimental afternoon of anonymous painting”. Immersed in this surreal dimension, I met many young Chinese with open, critical and innovative minds. Speaking with them I understood that China is not only growing in infrastructure, but also in ideas and criticism. Taken by the place, here is where I spent my last available days, and with a visa dangerously close to expiring, I had to get to Kunming by train. Exploring China by bicycle was surprisingly safe and easy. My sketchy knowledge of the language helped me to not get lost and locals quickly helped me and every break of my bicycle. The most difficult problem was food poisoning due to the terrible conditions of food handling in the villages. But an empty intestine was more than compensated by a heart full of new friendships and wonderful memories.